My materials are good I don't have any problems, the only thing that broke was the screen from my shaver and I will replace it with the new one I have. If you are to send a package peanut butter with candy from the US would be good, maybe some black socks and other things you would like to send and be sure to only use US postal service. This last week went very well, we are getting everything ready for a wedding the 5th of November, with documents they need to show before, with invitations, it is some work but work that is well worth it so that Marcia can be saved and bring the gospel into her home and to heal this family. It has truly been a miracle and we can feel the love and happiness that has flooded into their lives. We are working with another couple were the Sister (Janaina) is a member and will marry with Adriano the 19 of November he will be baptized the same day with his daughter. On Saturday we were able to go to the temple in Campinas just to see and make a goal with them that in one year they will enter and be sealed, we were able to go into the waiting room and teach them a little about the purpose of temples and where they just get a taste of the spirit and the desire to make it to the end. I have pictures and I will try and send them when I get to a computer that actually works with my camera. I can use Skype but the problem is being able to find a computer on Sunday that has Skype, but I have to wait to see if I will stay here in São Manuel or move to a different area, because transfers are on the 15 of November, But My companion said that I can call two days before Christmas to arrange for my call or on Skype but I will know more in a few more weeks. I am very excited for you, a great mission leader and a bishop it makes all of the difference. If you can always have investigators with members, which is essential for lasting conversion which the Beacon Hill ward does wonderfully. I guess you can talk about me, but really talk about the joy and the blessing to help people really change their lives and follow Christ by serving a mission. I am in São Manuel which is pretty small only us two in a city of 50,000 more or less. São Manuel only has a small branch of about 40 active, but things here aren't the greatest, a branch that hasn't grown in 20 year, we have 300 people baptized here in this city but all have left the church for one reason or another, but they didn't really have a firm testimony and the members weren’t in the conversion process. The members really make all of the difference when a ward or branch is unified and willing to work the lord blesses the ward, but when there is no unity people leave. Yes I gave a talk a few weeks ago which went well everyone understood and the spirit was there. Here in Brazil there was no winter only hot. Some times during the “winter” it got chilly during the night but not too bad. Here is the state of São Paulo it is dry the same thing in Spokane, but this past week it only rained for 7 day it only rained and got pretty humid. My Companion is wonderful I am learning everything I need to really know to be a good missionary and senior companion, I have learned more things from Elder Coelho than my trainer, he is hard and lets me know when I do things wrong but I learn every time and do better. We marked two wedding these past two weeks, and what a miracle it has been, we will see 4 people enter the water of baptism in just a short few weeks and I will let you know how it went. I will find out about Skype and telephone, I heard we can use Skype but everything is closed on Christmas and it is on Sunday and we can't buy the internet time like usual, I will tell you when I find out. Also I sent a DVD of all of my pictures on Monday and it should arrive in a week or so, let me know when you get it, it has 200 pictures with some video, I hope you will like it. I was wondering if Bishop Wilhelm would be released, it's great that Bishop Borders is the Bishop. That is very neat that Acea got to play for Richard Elliott. I bet his was very excited and I hope he learned a lot. The mission is wonderful and as always not the easiest thing in the world to do. We work hard in the sun and the heat but don't find those people that really want to give up every vice and sins to really follow Jesus Christ and be baptized and stay firm, and endure to the end. We are teaching two couples that are ready to be baptized but have to get married first but with faith and patents they will be married in the near future. My companion is wonderful and I am learning more things than I did with my trainer, to really be the best missionary I can be, in teaching, planning, and everything. I stayed in São Manuel for a least one more transfer and next week we are having a multi-zone conference and I will tell you how it goes. I have been thinking a lot about happiness and how to really obtain it. As a missionary you are really about to see the people you teach be happy there potential, I think we can just see a little bit of what Heavenly Father sees in us, we teach the gospel which by living it we receive true never ending happiness, but when people don't see that we, us missionaries the message we have, is really the answer to their prays for a better live is truly is heart breaking. Only by living righteously, overcoming our mistakes and weaknesses can we truly have peace and happiness in our lives but we first need to show this happiness with everyone. I will send my pictures for the plaque and on DVD for you guys the pictures for the plaque I will sent are the best they are going to get. Thank you for you wonderfully inspiring letter Acea and I am glad you like General Conference, I loved Elder Holland’s Talk, Elder Christofferson, Elder Scott foi muito bom. Acea I am sorry that I have not sent many pictures and they aren't very good I will do my very best to send them. I only have email right now and I can't even take the pictures from my camera in this area, but I will probably send a DVD of all of my pictures. 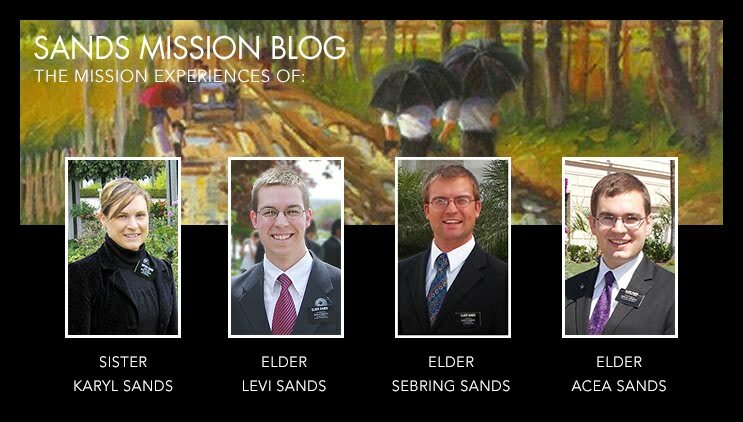 If I had more time and not serving the Lord I would have perfect pictures, it is important to send picture to share the experience of the mission but a mission is not only about the pictures. You will understand it is not so easy on your mission. General conference was great Acea. Yes I watched all 10 hours in Portuguese, It was great and a privilege but of course I didn't understand 100% perfect but I understood what the spirit spoke to me. I loved Elder Scotts talk, it was helpful to me to learn Portuguese better and comforting to, because he speaks Portuguese fluently Elder Scott translated and recorded himself speak in Portuguese which inspired me. And a neat fact, all of the talk for general conference are translated in Brazil by one brother in writing he is the stake president of the Stake itatiba my last area and had the privilege to talk to him, what a spiritual giant and very humble. So great news, we are helping a couple marry and we sent for his birth certificate two weeks ago, and because of the post office strike going on right now we received it on Monday and we will mark a date and baptize him in the near future, a elect, a eleito is a person that accepts everything and desires to be baptized which he really is. I had a question, for Christmas would it be possible to make a conference call with you and Levi and Julie?